Product code: 729719X1 Categories: 500 Format Modules, Analogue Processors. SSL’s range of modules for the 500 series rack format currently consists of five different modules; the classic Stereo Bus Compressor which has featured on every model of SSL large format analogue console, E-Series EQ and E-Series Dynamics modules which deliver the legendary sound of the channel strip processing from SSL’s 1980’s E-Series console, and the incredibly versatile VHD Pre input module which can deliver ultra-clean recordings or a range of more saturated tonal characteristics and the LMC+ module, a new twist on the legendary SSL Listen Mic Compressor. 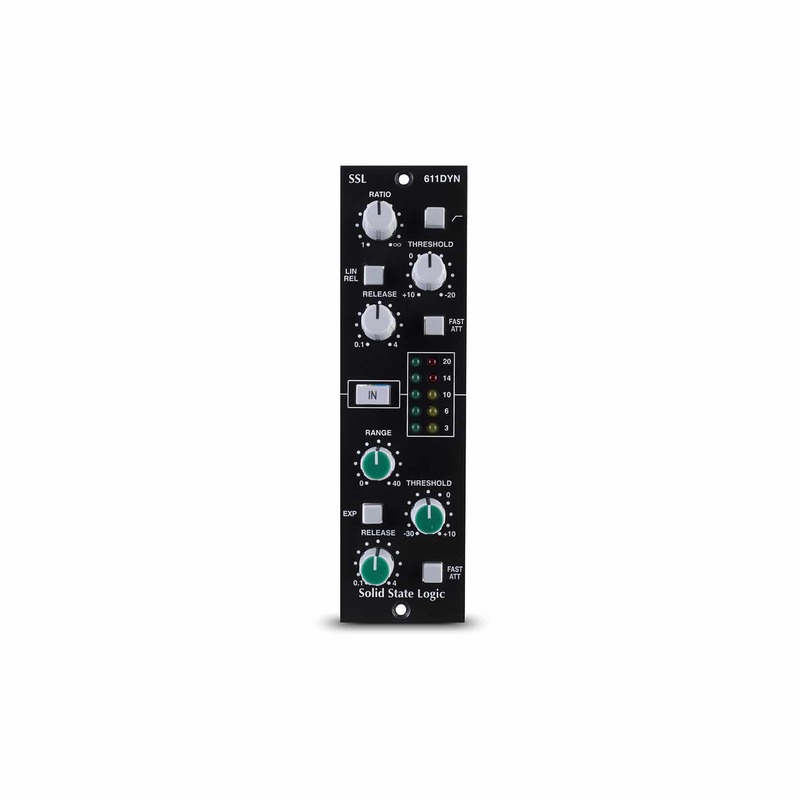 The new E Series Dynamics Module for 500 Series racks reproduces the legendary sonic signature of an early 80’s classic, the SL 4000 E console channel strip, which was featured on countless 1980’s recordings. The E Series Dynamics Module features a compressor/limiter and an expander/gate, both of which return faithfully to the circuitry and key components which define the sound of the original SL 611E Series channel strip. A true RMS converter is used in the side chain while the gain element is an all discrete design identical to the Class A VCA chip used in the original unit. The compressor contains additional switching options to defeat the over-easy curve and to use a linear release instead of the more usual logarithmic curve. The result is a compressor with three distinct voices, each with its own musical character.